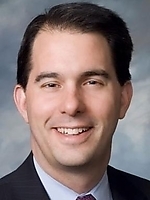 Info On January 3, 2011, Scott Walker was inaugurated as Wisconsin’s 45th Governor. On his first day in office, Governor Walker called the State Legislature into a special session on job creation. Since that day, he has proposed reform legislation calling for a transformation of the Department of Commerce into a public-private entity named the Wisconsin Economic Development Corporation. This new organization will be aimed at promoting the State of Wisconsin as a beacon for economic opportunity while keeping in place proper government oversight. Governor Walker has proposed other reforms including small business tax relief, frivolous lawsuit reform, and the creation of the Commission on Waste, Fraud, and Abuse, which will aid in balancing Wisconsin’s estimated $3 billion deficit. Governor Walker’s proposed reforms are a part of his bold vision for Wisconsin that is founded upon making state government more efficient and allowing the private sector to create 250,000 jobs by 2015. Scott Walker was born on November 2, 1967 to Llewellyn and Patricia Walker in Colorado Springs, Colorado. He spent his earliest years in Plainfield, Iowa, where Llewellyn served as the pastor of their local church. The family moved to Delavan, Wisconsin in 1977 when Scott’s father was called to pastor a church there. Scott was involved in sports, band, church, and achieved the rank of Eagle Scout. He remains active in the Boy Scouts of America to this day. While in high school, Scott was selected to attend the American Legion’s Badger Boys State Program in Ripon. There, he was selected as one of two representatives to Boys Nation in Washington, D.C. Both of these programs teach young men that the American form of government is stronger and more vital in today’s world of struggle and change than ever before. The experience opened Scott’s eyes to public service. In 1986, Scott moved to Milwaukee to attend Marquette University. While still in school, he worked for IBM before leaving to work full-time in financial development for the American Red Cross. Scott was elected to the State Assembly in 1993. While there, he chaired several committees and authored important pieces of legislation that include: Truth-in-Sentencing, photo identification requirements to vote, and the elimination of the statute of limitations in sexual assault cases. In 2002, Scott was elected Milwaukee County Executive to reform the scandal-ridden county government. The scandal rocked Milwaukee County to its core and left taxpayers on the hook for millions in pension obligations. For eight years as County Executive, Scott faithfully kept his promise to spend taxpayer money as if it were his own. He cut the county’s debt by 30%, reduced the county workforce by more than 25%, and authored nine consecutive budgets without increasing the property tax levy from the previous year. Despite failing national and state economies, Milwaukee County recorded a budget surplus in 2009. Scott is married to Tonette, and they have two sons, Matt and Alex. They are active in the community and their church.